As the 2018 World Cup heats up, Rock Center is getting in on the action with live outdoor broadcasts from Telemundo Deportes, running from June 30 through July 15 on Rockefeller Plaza. 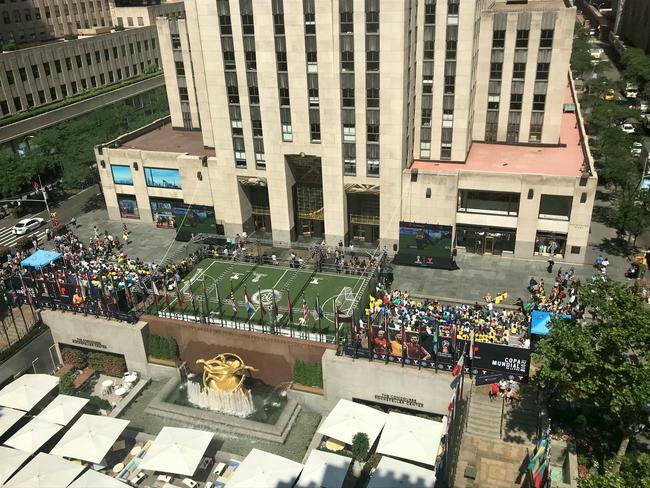 Along with bleachers and big screens set up for watching the matches, with all coverage in Spanish, there will also be a custom-built soccer field for activities by the New York City Football Club, who previously hosted a 24-hour game on the Plaza in March. The festivities kick off at 10am on Saturday, June 30, with a viewing party for the first round of 16 matches, followed by soccer on the pitch. At night the crowd cheers on NYCFC in their away game against the Chicago Fire at 8:30pm. Over the two weeks leading up to the World Cup Final on July 15, fans will get to face off in pick-up games, tournaments and clinics by NYCFC, and have meet-and-greets with the team's players. And spectators can also feast their eyes on a vintage soccer jersey exhibit, produced in partnership with Classic Football Shirts. Viewings and games are free and open to the public, and take place on Rockefeller Plaza between 49th and 50th Streets and Fifth and Sixth Avenues. Stay tuned for a full schedule of events, and see a map of Rockefeller Center here.